ISLAMABAD, Pakistan (October 17, 2001 1:44 p.m. EDT) - A year after a Taliban ban virtually wiped out opium production in Afghanistan, desperate Afghan farmers are once again preparing their fields for planting poppies, a U.N. official said Wednesday. That could signal a major increase next year in the availability of heroin and other opium-based narcotics in markets in the United States and Western Europe. Bernard Frahi, the U.N. Drug Control Program representative for Pakistan and Afghanistan, said reports from major poppy-growing areas of southern and eastern Afghanistan indicate fields have been tilled in a manner that suggests farmers will be planting poppies. It is clear the fields are being prepared for poppies and not wheat, cotton or other crops because of the pattern of tilling, Frahi said. Poppy fields are tilled in an undulating pattern to allow for free-flow of water. Fields prepared for other crops are flat with canals constructed along large tracts for irrigation, he said. Signs that Afghan farmers are resuming poppy cultivation are a bitter disappointment to U.N. drug control officials. Last year, the Taliban's supreme leader, Mullah Mohammed Omar, banned poppy production as "un-Islamic." 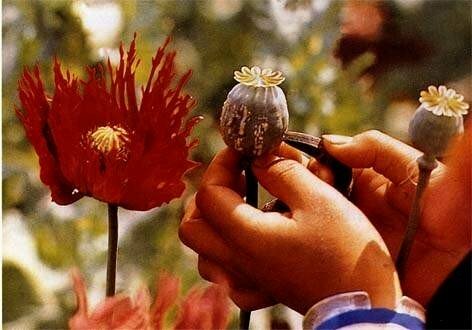 Before that order, which the United Nations said was rigorously enforced, Afghanistan had been the world's largest producer of opium poppies. As a result of the ban, areas of Afghanistan controlled by the Taliban produced a few hundred tons of opium, compared with 3,200 tons produced last year and 4,500 tons the year before. "This was the one success story in Afghanistan," Frahi said. "For us it was very important and came after three years of dialogue with the Taliban." The planting season begins in October and continues for the next two months, Frahi said. Harvest time is in April when it will be evident to what extent Afghanistan has returned to opium production. Frahi said it appeared the Taliban, with their hands full in the face of U.S. air attacks, were not enforcing the ban. Farmers devastated by last year's ban were taking advantage of the relaxed enforcement to plant a high-profit crop. He said Omar issued an order on Sept. 3 extending the ban - a week before the terrorist attacks in the United States. "Everything stopped on Sept. 12," Frahi said. According to a U.N. report released Wednesday, the Taliban had reduced poppy production in Afghanistan by an incredible 91 percent. "Almost all major former poppy growing provinces had no poppy or relatively small areas under cultivation this year," the report said. "The reductions are clearly the result of the implementation of the opium ban." Most of the poppies grown last year in Afghanistan were in the 5-10 percent of the country controlled by the opposition northern alliance, Frahi said. He said production in opposition-controlled areas was up this year because opium dealers were offering farmers "10 times more for opium as well as cash advances." The Taliban ban may have been a major contribution to reducing heroin in the West but was a devastating blow for Afghanistan's farmers, Frahi said. Farmers usually borrow money for seeds and other supplies and pay off the loan at harvest time. However, with the poppy ban in place, Taliban drug control officers said some destitute farmers were so desperate for cash they were giving their daughters, some as young as 10 years old, as brides in exchange for having loans written off. Frahi said hundreds of small farmers sold their land to repay debts. Farmers and day laborers were among the tens of thousands of refugees who slipped into Pakistan late last year and early this year. According to U.N. figures, the Taliban made about $30 million from opium production in Afghanistan before the ban. The money came from taxes the Islamic militia charged farmers. The total gross income of drug production in Afghanistan is about $180 million.